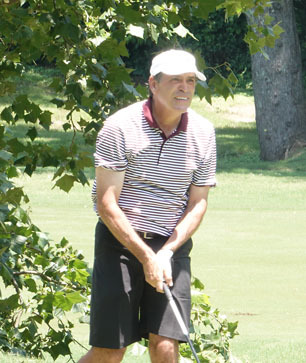 Pat Thompson birdied his final hole and then won a playoff for the championship at t6he hantileer National Senior Invitational. 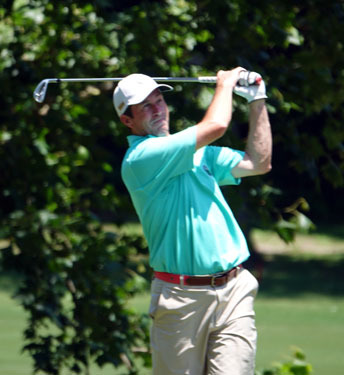 Pat Thompson won the Chanticleer National Senior Invitational at the Greenville Country Club’s course on the first hole of a sudden death playoff. However, it was a great approach shot on the 18th hole that tied the Asheville golfer with Eddie Hargett of Columbia and forced the playoff. Thompson had flirted with the lead during the final round of the championship. At one point he held the top spot, but with first round leader Todd Hendley, Allen Peake and Hargett all within a shot there was no room for a mistake. Hendley experienced some trouble on the front nine holes carding a 5-over par 41. The Thornblade Club golfer scrambled back from 4-over par to be within a shot of the lead on number 18. Hargett and Peake, playing in front of Hendley and Thompson, had the first chance to break the tie. Peake found the water in front of the green while Hargett’s approach shot took a crazy bounce off the rocks in front of the green and landed on the putting surface. Forty feet of green was between Hargett and the hole. His putt followed a line with a three foot break and died in the cup. The birdie gave Hargett the temporary lead with only Thompson in a position to catch the new leader. Eddie Hargett made a 40 foot birdie putt on his final hole to make it into a playoff. Thompson followed up a solid tee shot with a spectacular second shot that spun back to within three feet of the pin. “I knew there was a bit of a back stop behind the pin,” said Thompson. “I wanted to be aggressive so I hit it in there and it spun back close to the pin. It was the best approach shot I hit all week,” he said. Amazingly, Hendley’s approach was just as good and almost in the identical spot. His shot spun back towards the pin and hit Thompson’s ball or it might have gone in for an eagle to force his way into a playoff. “I guess I should have had him mark the ball,” said the defending champion. “I will know better next time,” he added. Hendley made his four foot putt and Thompson was able to get a good read on the line. “I was able to watch Todd’s putt and it helped,” he said. Thompson and Hargett finished regulation play at 1-under par and went to the first hole for the playoff. Both golfers second shots missed the green. Hargett punched his chip to within 12 feet of the hole. Thompson was in better position and his chip landed three feet from the pin. Defending Champion Todd Hendley finished one shot out of the playoff. With Thompson almost a lock to make his putt Hargett had to make his to keep the playoff going. I nstead his putt slipped past the right side of the hole. Thompson was able to roll in his short putt to win the championship. “I’ve had the opportunity to play golf all over the world and I like this course as much as any course I have played. It is a fantastic test of golf,” said the winner. Hargett finished in second with Hendley scrambling back to finish even for the tournament in third place. Peake shot an even par final round to finish fourth while Walter Todd from Laurens had the best round on the final day shooting a 2-under par 70 for a fifth place finish. “Some of my friends have played here and won and they told me I needed to get one, and I did. It feels great and I am very happy,” concluded the winner. The tournament included two other divisions. Last year’s runner-up George Washburn, iII of Frederick MD shot a final round even par 71 at the Riverside course for a three day total of 218 to win the Legends Division by eight shots over John Blank. In the Super Senior Division, John Armstrong from Frostburg, MD won a playoff over Paul Schlachter on the first extra hole to claim the title in the division. 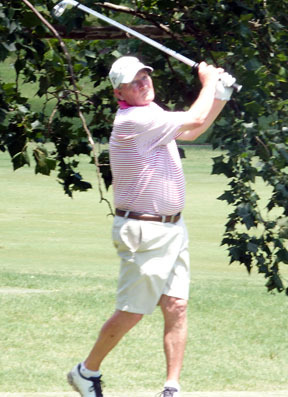 Pat Thompson of Asheville won the 8th annual Chanticleer National Senior Invitational. 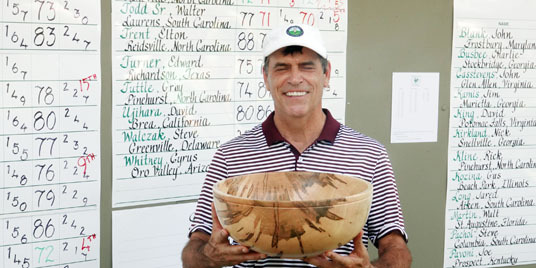 The Chanticleer National Senior Invitational began in 2011 with the idea that it would provide a superbly conditioned, very challenging course on which to present a premier invitational tournament for elite senior and super senior golfers recognized for their playing accomplishments on a national and international scale. The CNSI was awarded 1,000 points by Golfweek and is a counting event for the World Amateur Golf Ranking (WAGR) points.